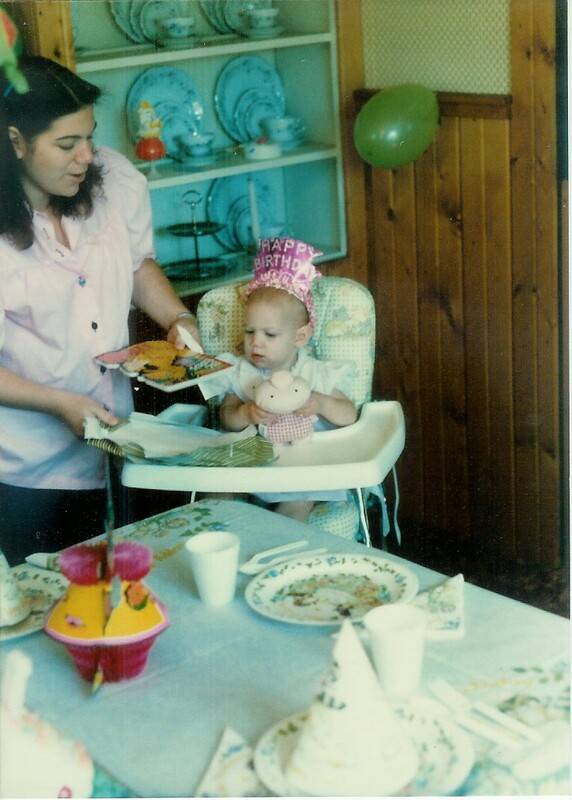 After just having Adaline’s first birthday party last month and with my 31st birthday coming up the end of September, I thought that I’d share photos from my first birthday party. 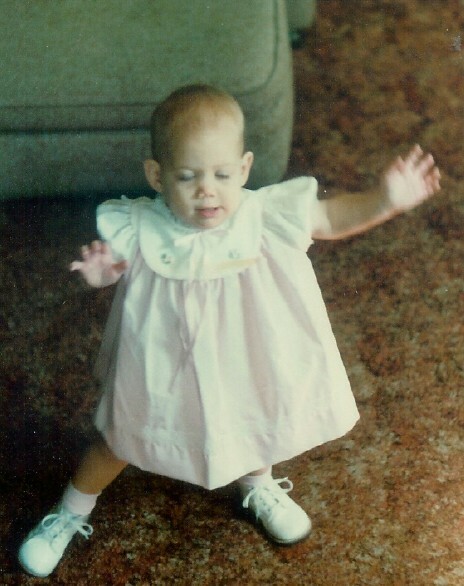 I don’t remember it, well, because I was only 1! 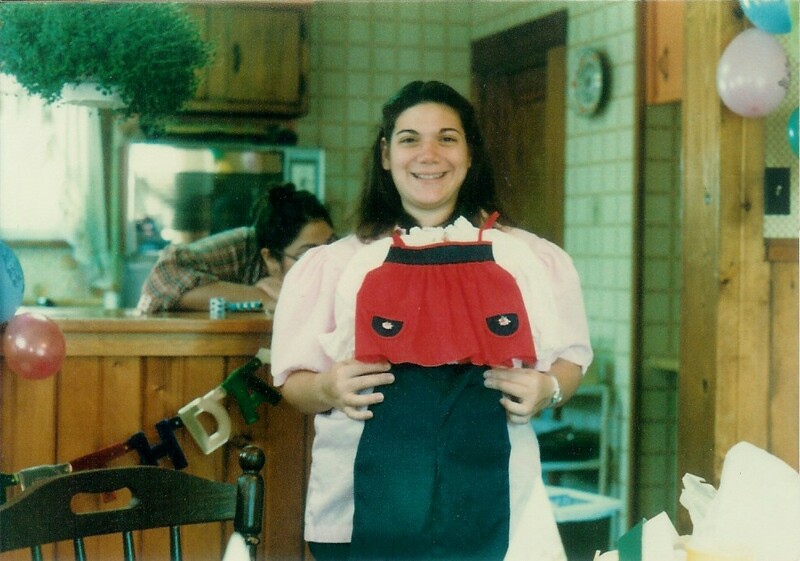 It appears as though my mom did a woodland creatures theme. The raccoon and squirrel on the paper products are so adorable. 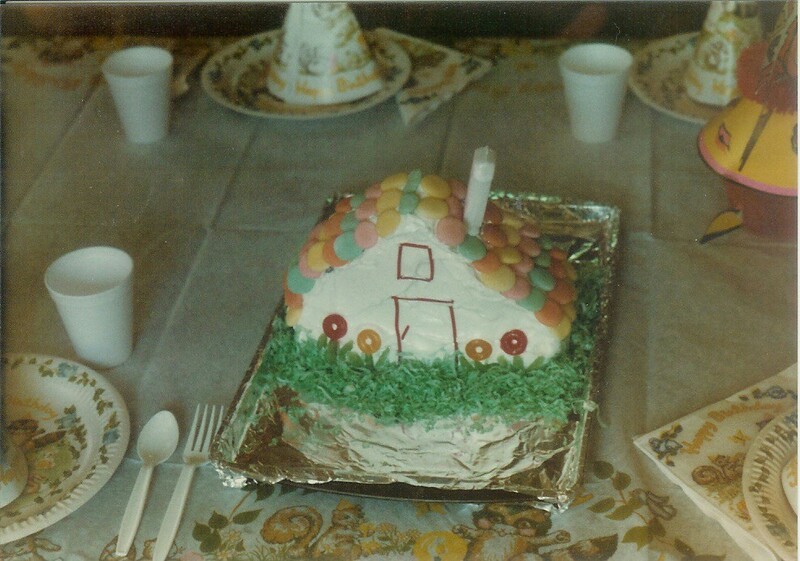 The little cottage cake was my mom’s first attempt at cake decorating she tells me. 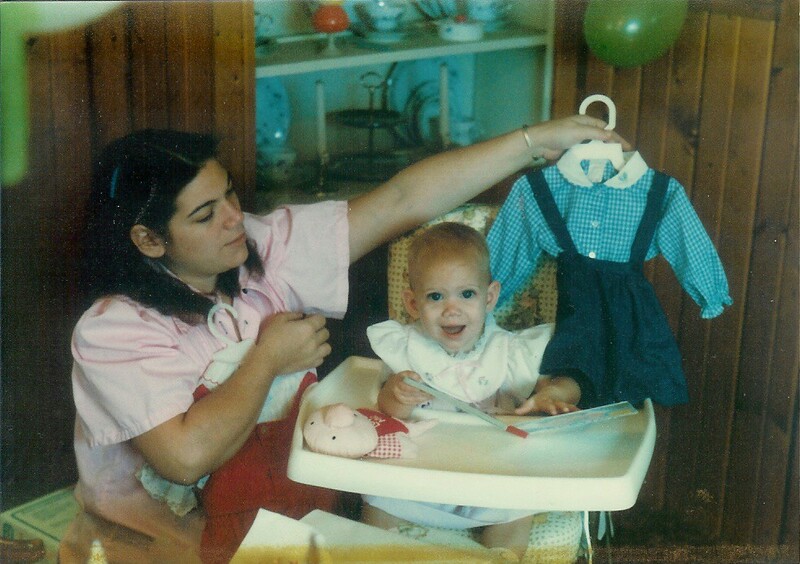 By the way…she was only a month away from delivering my sister in these pictures! That’s my aunt hiding in the background behind my mom. That’s all of the photos that I have. 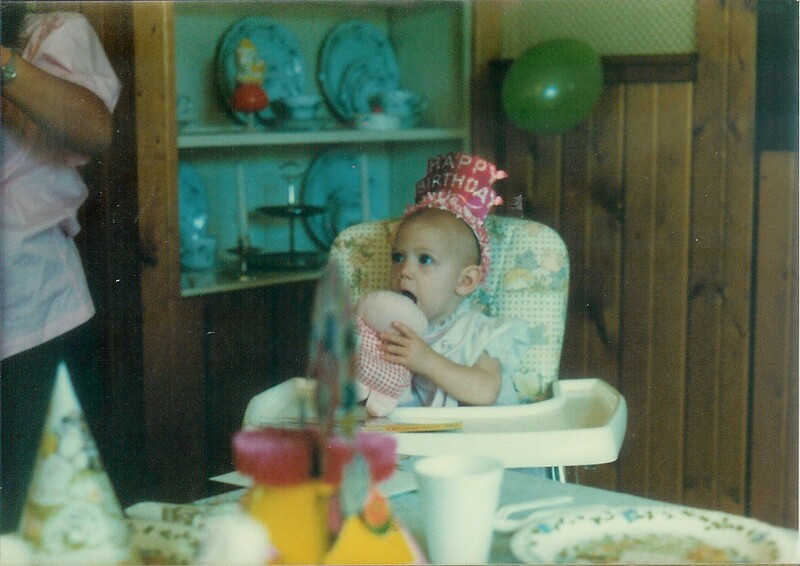 If any family out there has more pictures from my first birthday party, please send them! 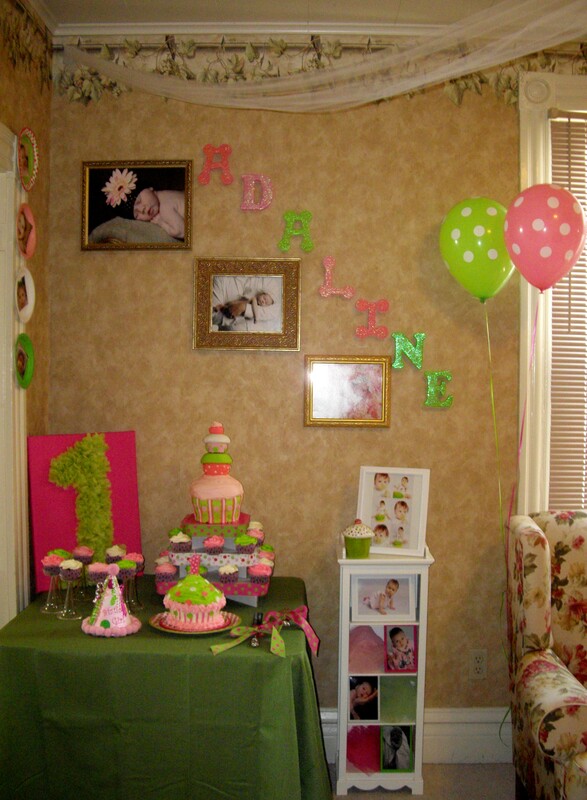 If you haven’t already, head over to Adaline’s first birthday party post and take a look! 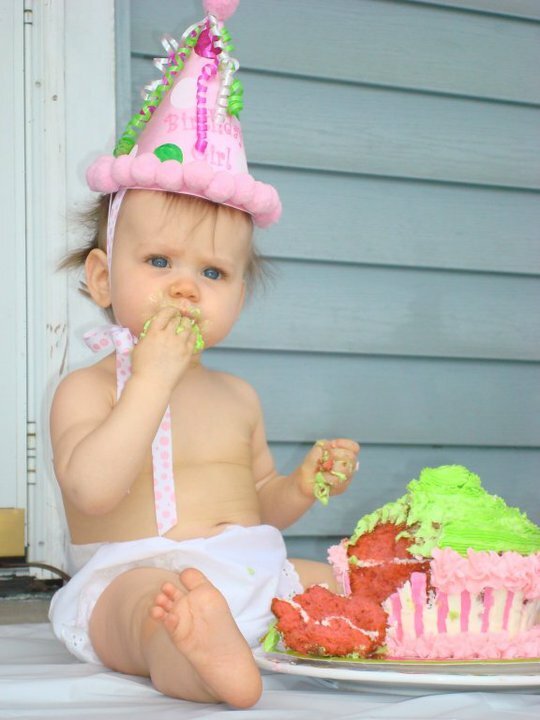 Be sure to stop back tomorrow and check out my 2nd Birthday! I love puzzles. Building puzzles is something that my mom and I have always loved to do together. 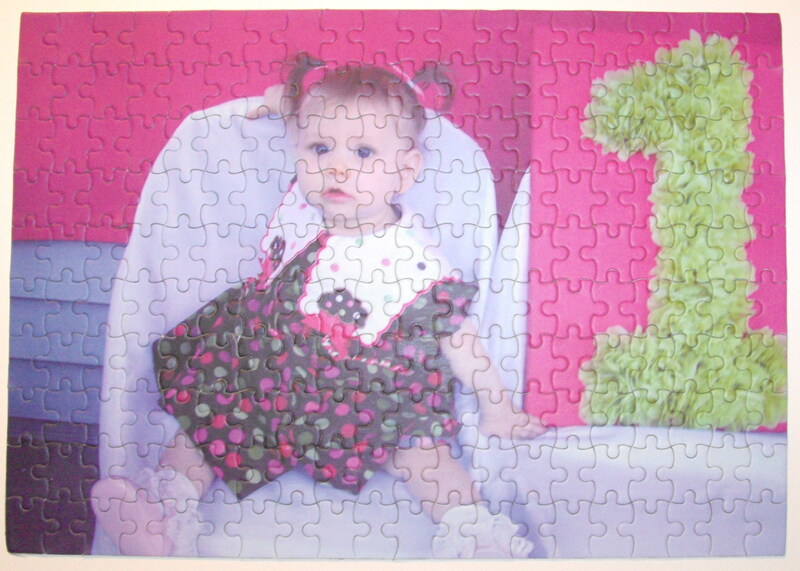 When I saw that ArtsCow.com was offering 200 piece photo puzzles for $9.99 shipped…I knew I had to get one made for Adaline’s birthday. 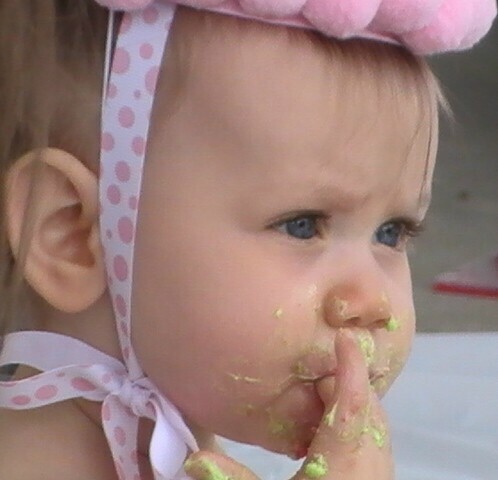 I chose the following photo from her birthday party. I received the puzzle in the mail a few days ago. I decided to build it to make sure all of the pieces were there. 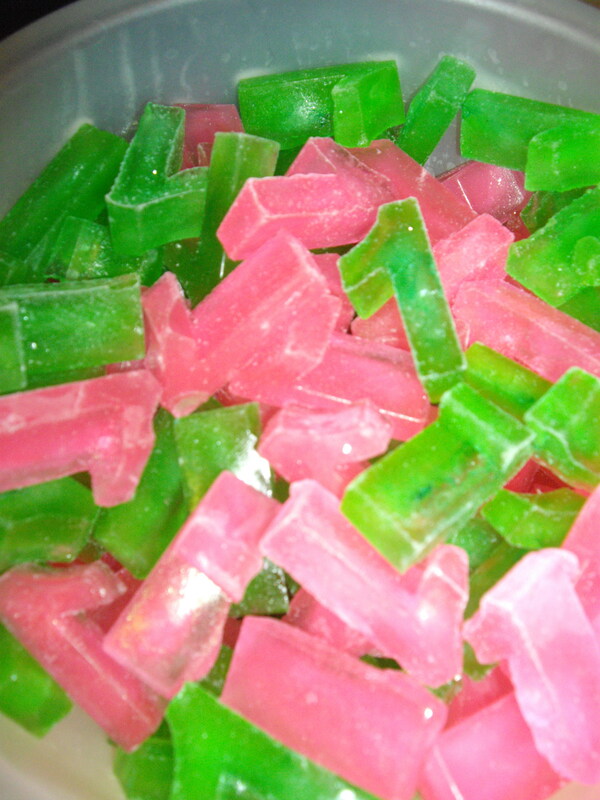 Here’s the final result. Yay, all the pieces were there! 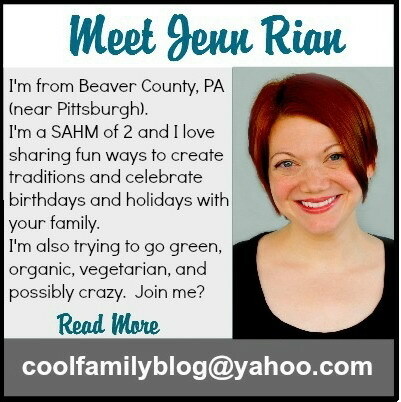 I think this is something that I’d like to do for birthdays every year (and maybe Christmas too!). 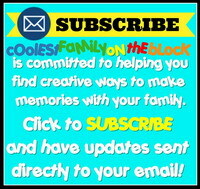 (Once they’re old enough) during the month leading up to the child’s birthday they can build their different birthday puzzles. Hopefully they’ll enjoy building puzzles with their mommy as much as I did! If not, I guess my mom and I will just build them anyway in honor of the birthday kid. Right now I’m keeping it in a zippered plastic bag. I’m wondering if I should try to find/make a box to resemble a puzzle box or just do a plastic container with a copy of the photo on it. Any suggestions? If you are intrigued with how I was able to solve this mind-boggling 200 piece puzzle you might want to check out Pointless Tutorials: How to build a jigsaw puzzle so that you too can become a puzzle building mastermind like myself. P.S. 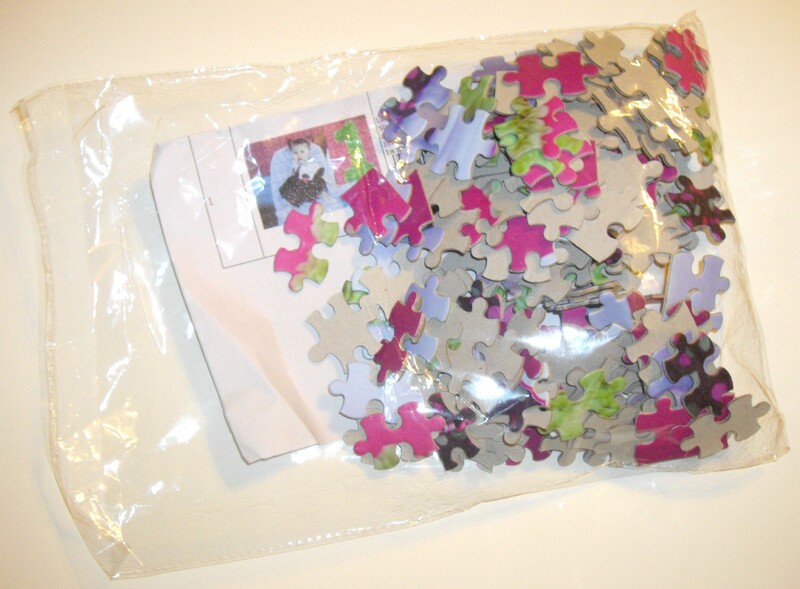 I’m sorry to tell you that the $9.99 shipped deal for the puzzles is over now. They always have something going on sale, so if you’re interested sign up for their emails. 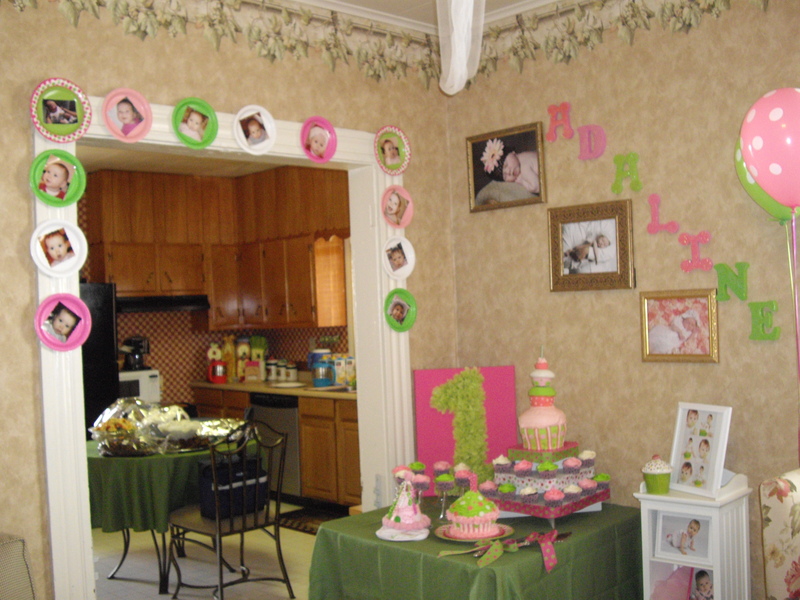 Here are some photos of Adaline’s first birthday party that we had on Saturday August 7, 2010. 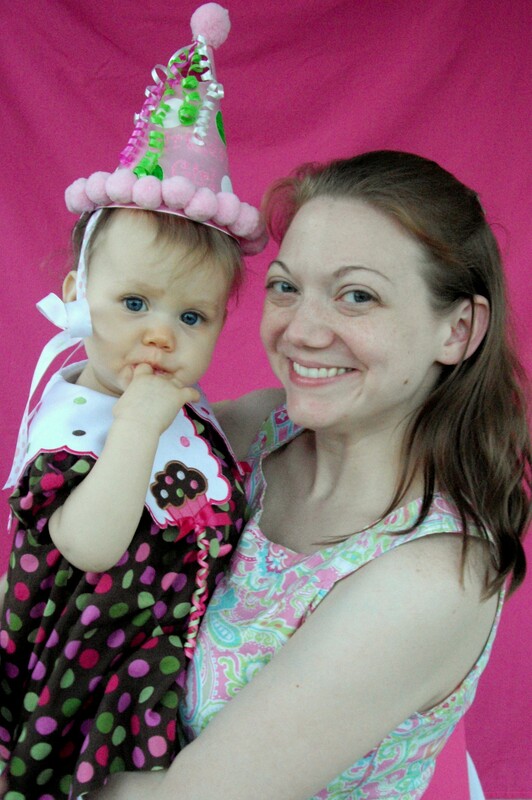 The theme was polka dots and cupcakes to match her dress. 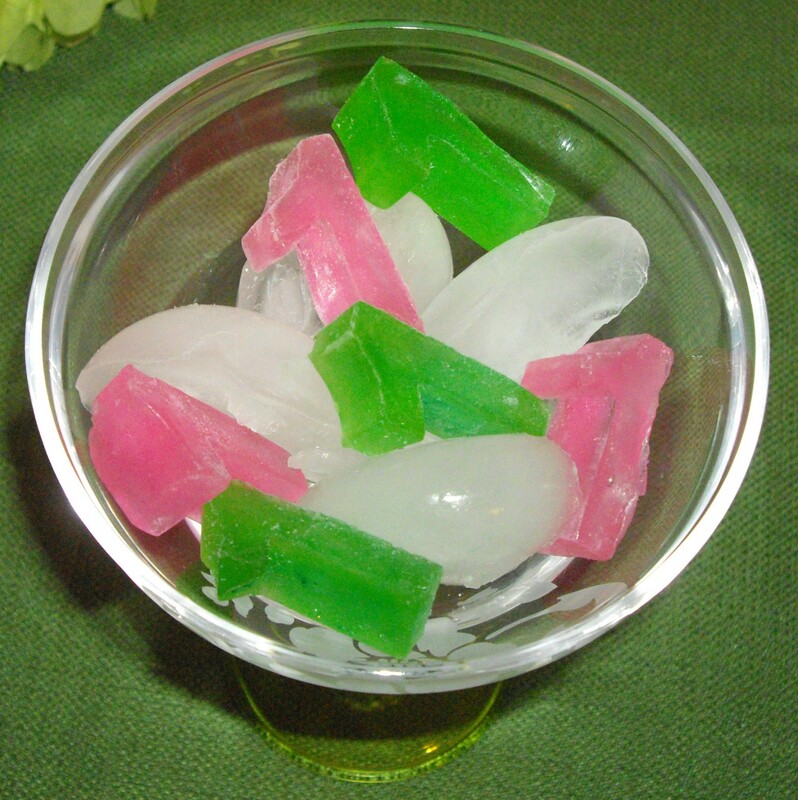 The colors were pink, green, and white. Unfortunately I don’t have a great camera so the pictures aren’t as nice as I’d like. Hopefully the details show through despite my poor photography equipment! 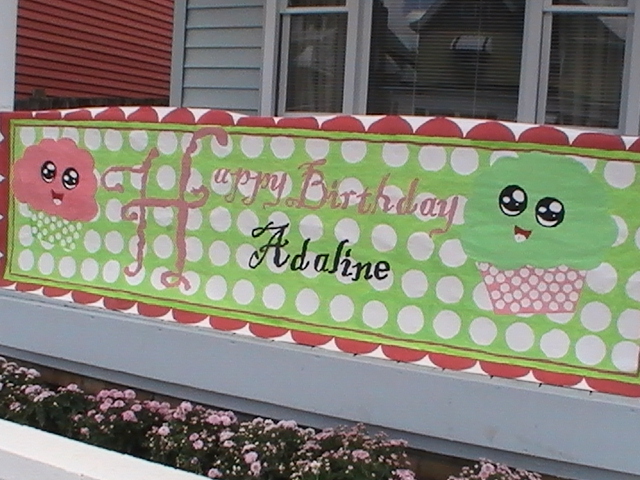 I made the number one sign out of an artist’s canvas covered in a pillow case with tissue paper hot glued to it. 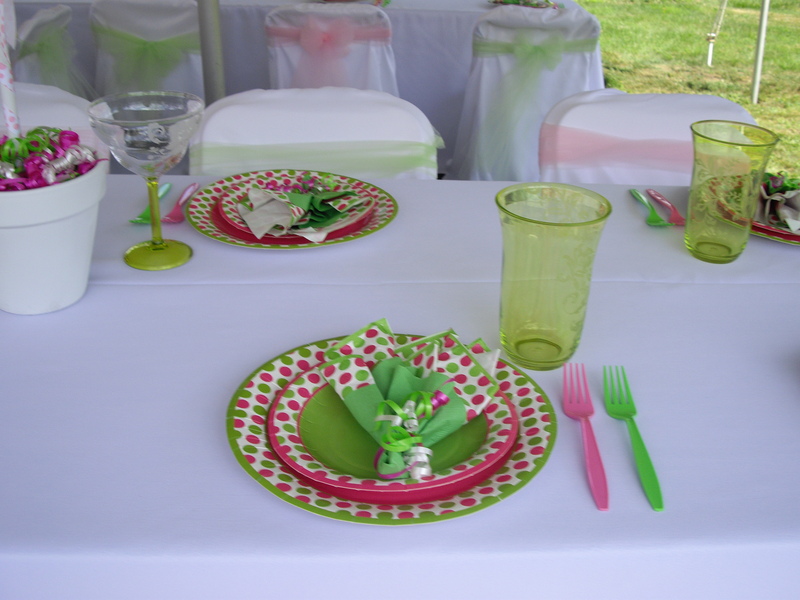 I saw the link on Polka Dot Market’s Facebook Page. 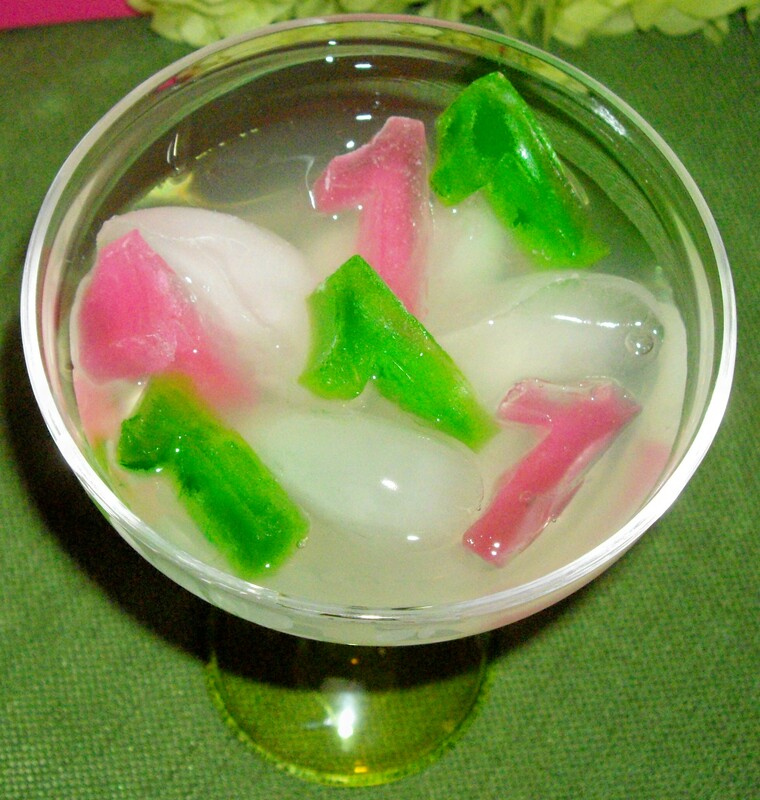 This DIY Tissue Number Sign was featured on www.prudentbaby.com! 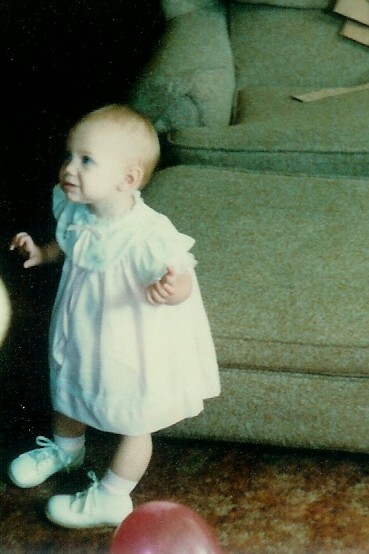 I found the Bonnie Jean dress at Burlington Coat Factory when Adaline was only 3 months old. 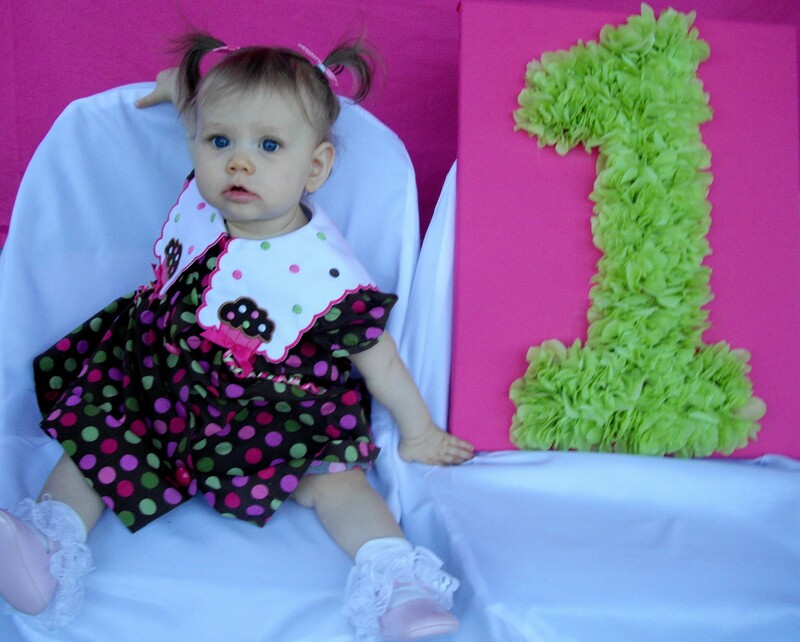 I thought it would be perfect as her first birthday dress, so I bought it right then! 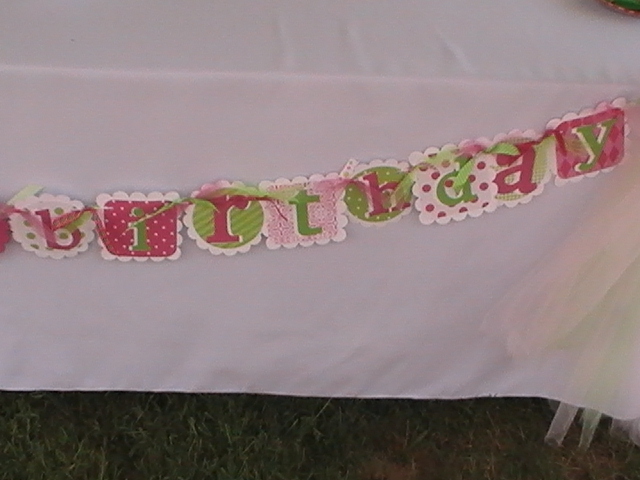 This sign was made by a close friend of the family who also came to the party to help take photos and videos. 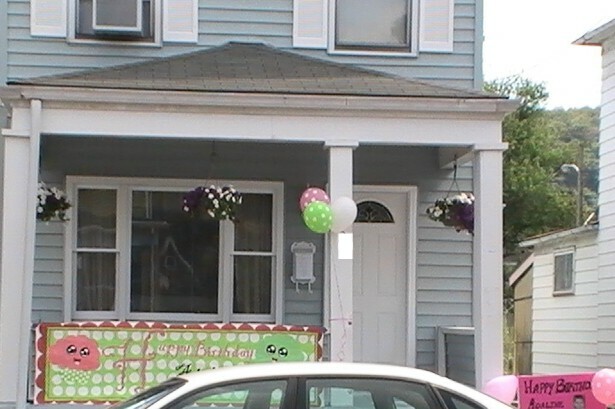 The sign fit at the front of our house perfectly…and she didn’t even do it on purpose! Thanks Sara! 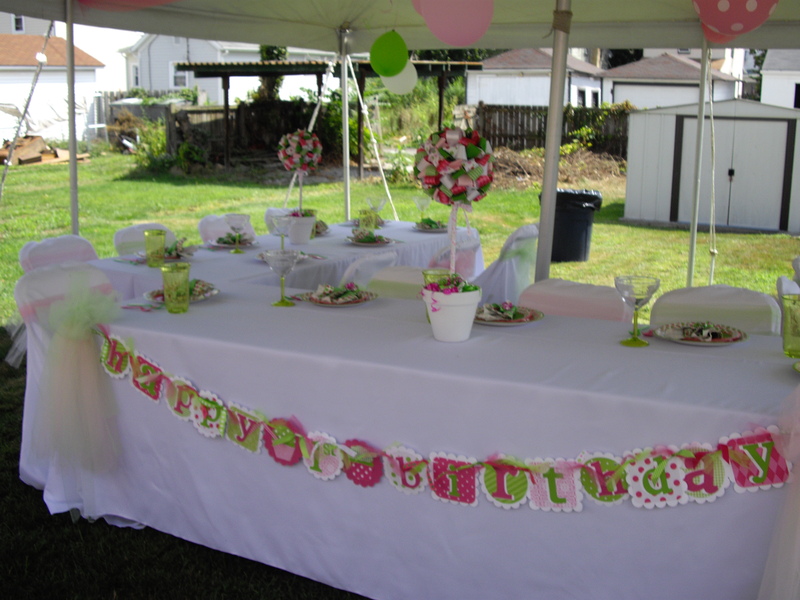 The super cute Happy Birthday banner is from Polka Dot Market Coupled with the dress this banner gave me the inspiration for the whole party theme and color scheme. 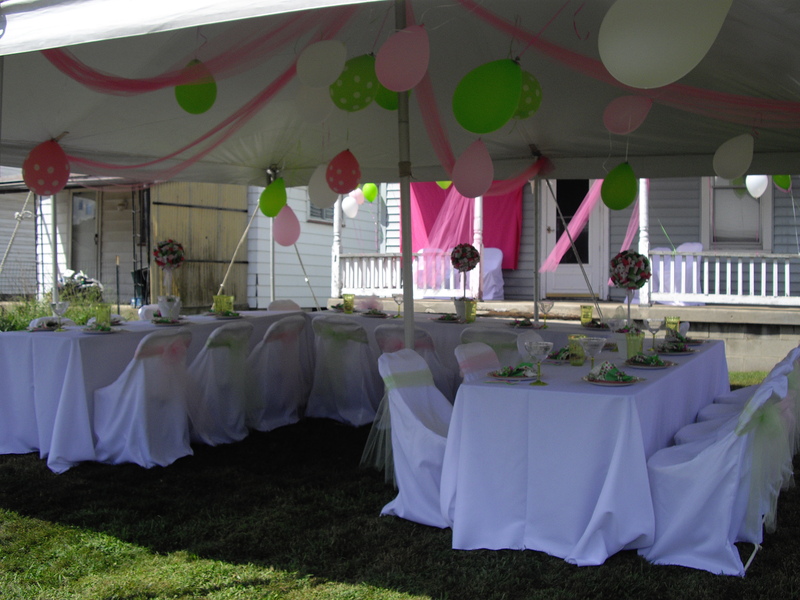 There wasn’t enough room inside our house for all of the guests so we rented a tent for the backyard. 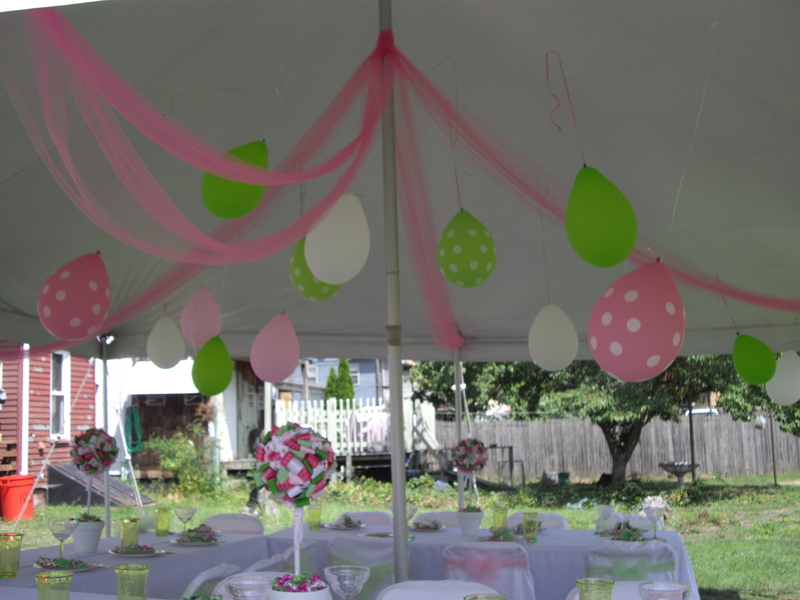 Inside the tent we hung tulle and hung balloons upside down. 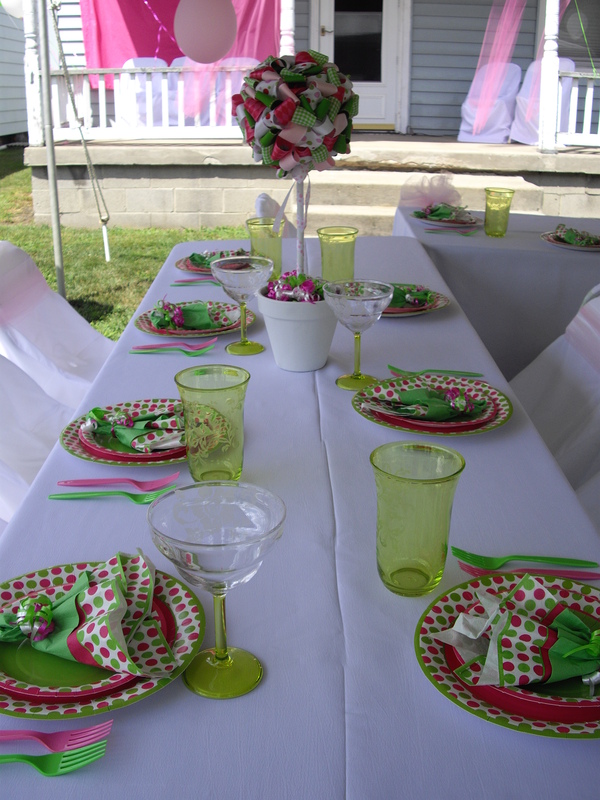 We added white linens on the tables and chairs and tied tulle around the chairs. 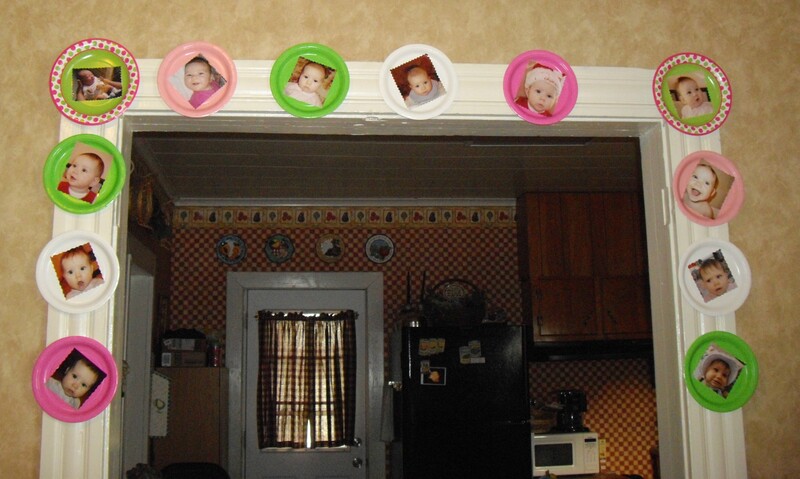 I glued Adaline’s photos to paper plates and taped them around the doorway in hopes that it would look like polka dots (does it?) 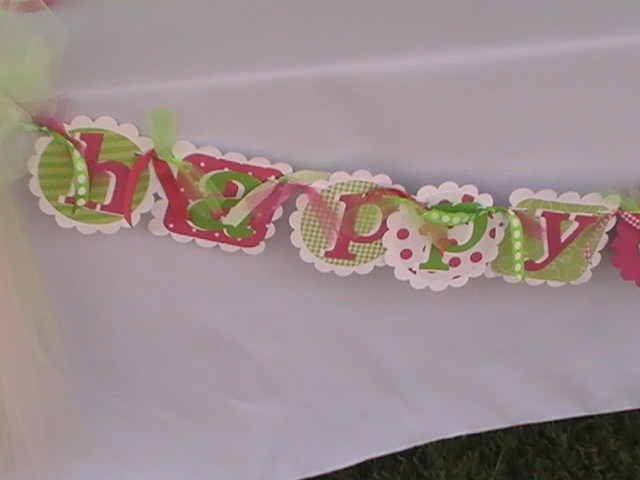 I hoped to do this around all of the doorways including the outside but I ran out of time. That’s the same number one sign from the first picture. 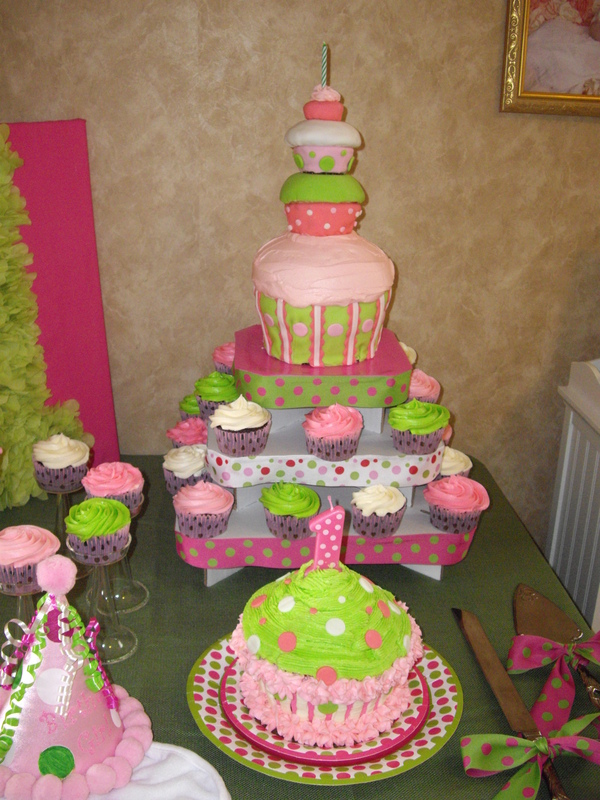 I found the cupcake pedestals at The Hobby Lobby. 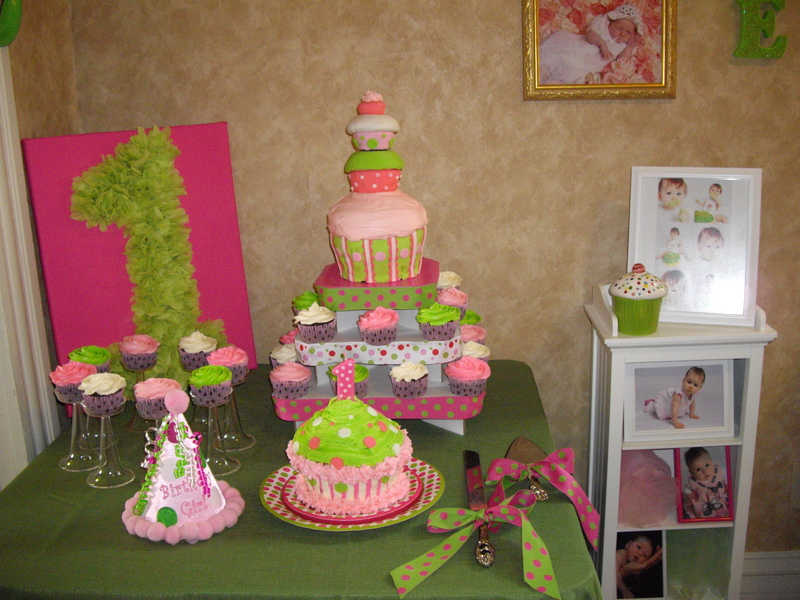 The tiered cupcake/cake stand is from Save-on-crafts.com, we added some ribbon from The Hobby Lobby. 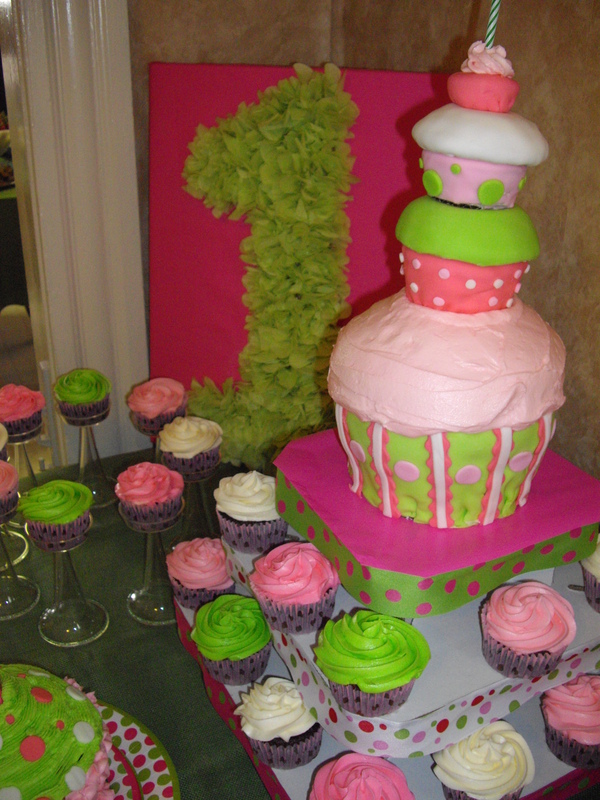 My mom made and decorated the main cake and all of the cupcakes. Although she’s been decorating with butter cream for 30 years, this was her first time using fondant. I think she did a great job! 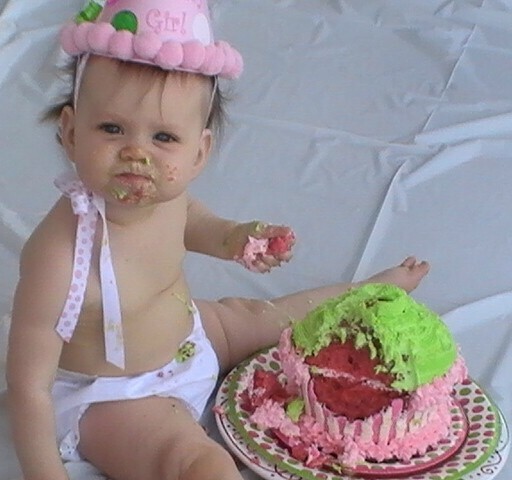 We got the idea for the cake from Wilton.com. 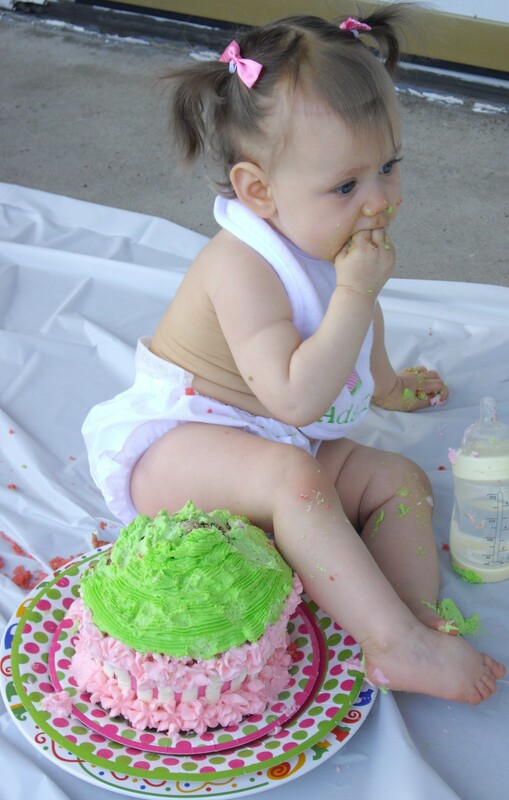 I decorated Adaline’s smash cake. This was my first time ever decorating a cake, you can see the gaps…whoops! 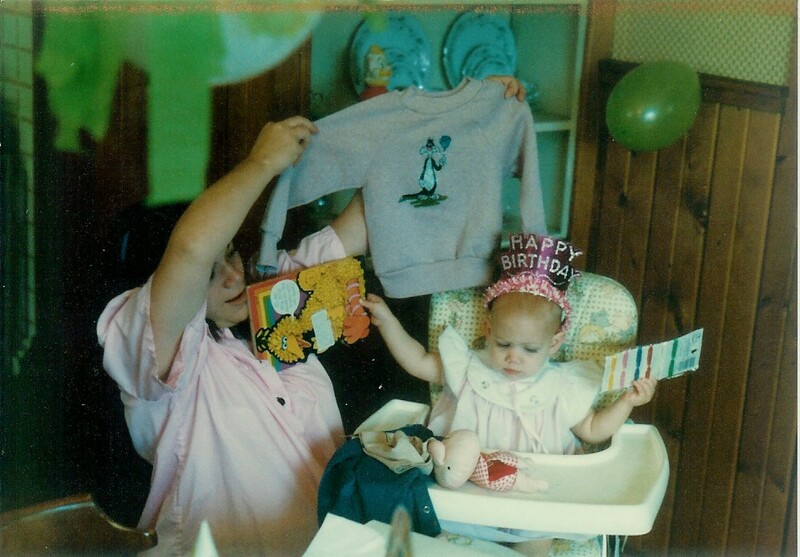 My mom is great at cake decorating and always made fancy birthday cakes for us when we were kids. I’d like to do the same for my kids but since I have no idea what I’m doing I asked her to make the main cake and I made the smash cake. That is butter cream icing but the polka dots are fondant. 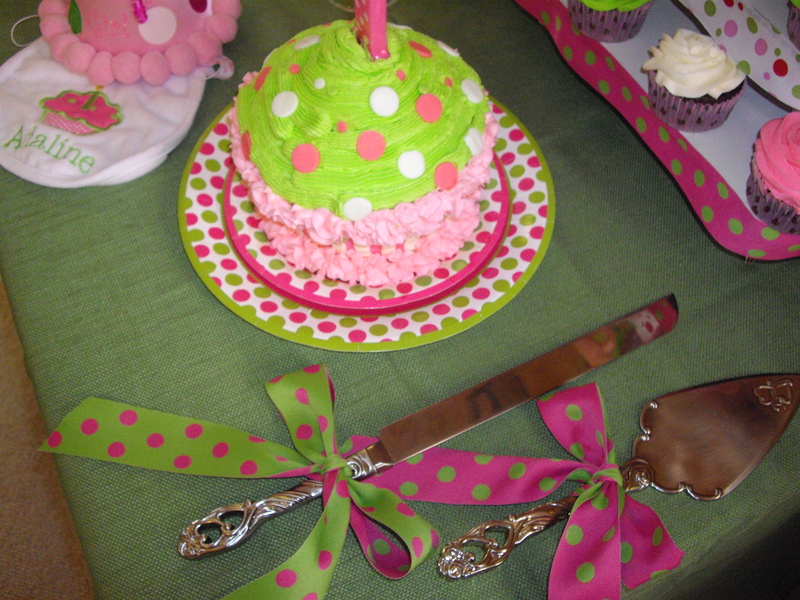 I found the polka dot number one candle at a local party shop where I also got the cupcake wrappers. 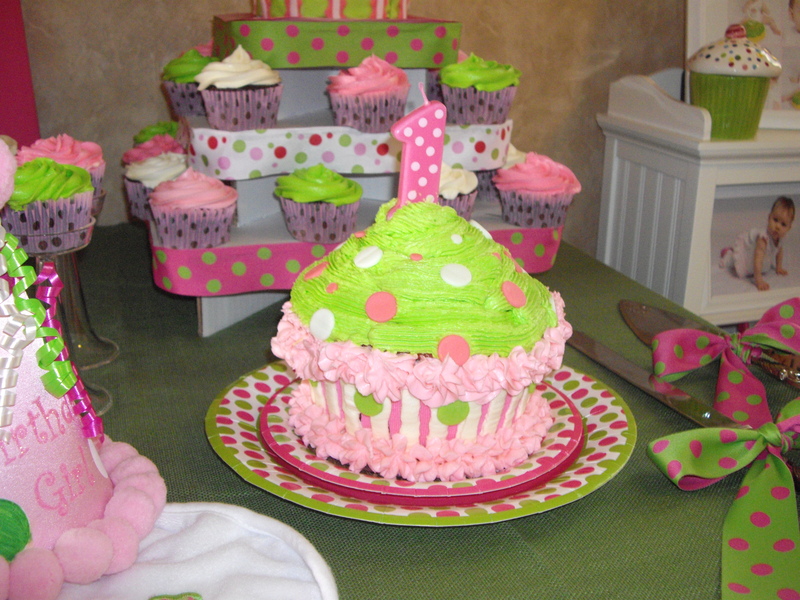 The wrappers were originally pink with white polka dots, but the chocolate cupcakes made they polka dots appear brown! 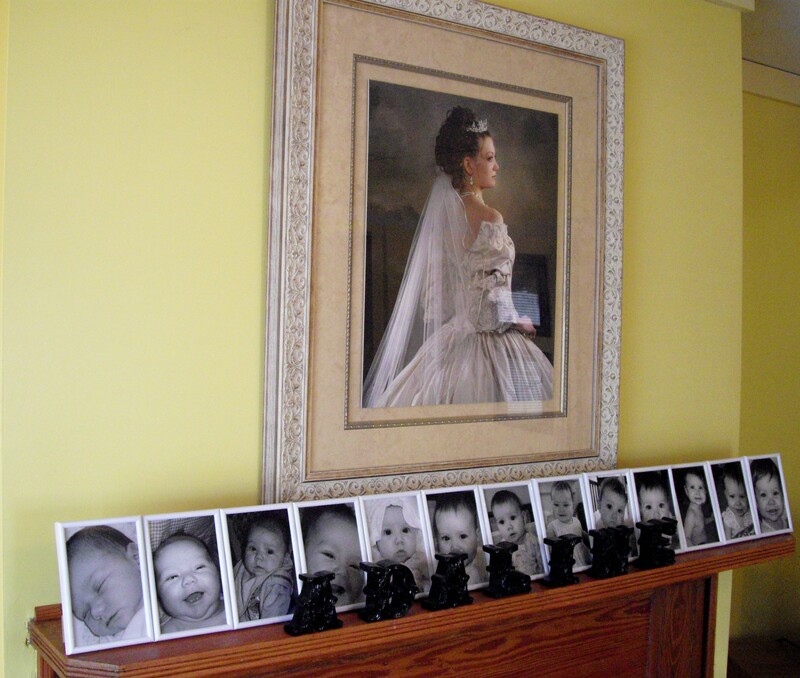 This photo timeline of Adaline was set up in our living room. Aside from the photo displays I didn’t decorate the living room because I couldn’t bring myself to put pink and lime green in our yellow and blue room. I thought it clashed too much…call me weird. I was going to make a blue and yellow happy birthday banner amongst other things but I never had the time to get around to it. 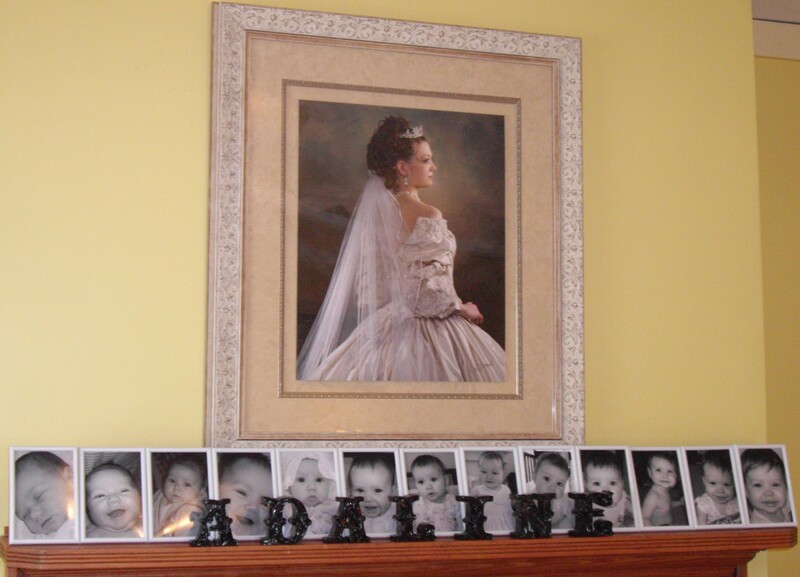 There are 13 photos of Adaline displayed, one photo a month from August 2009 to August 2010. I got the photo frames at Target. They were in the dollar spot, but they were $2.50 for a pack of 3. 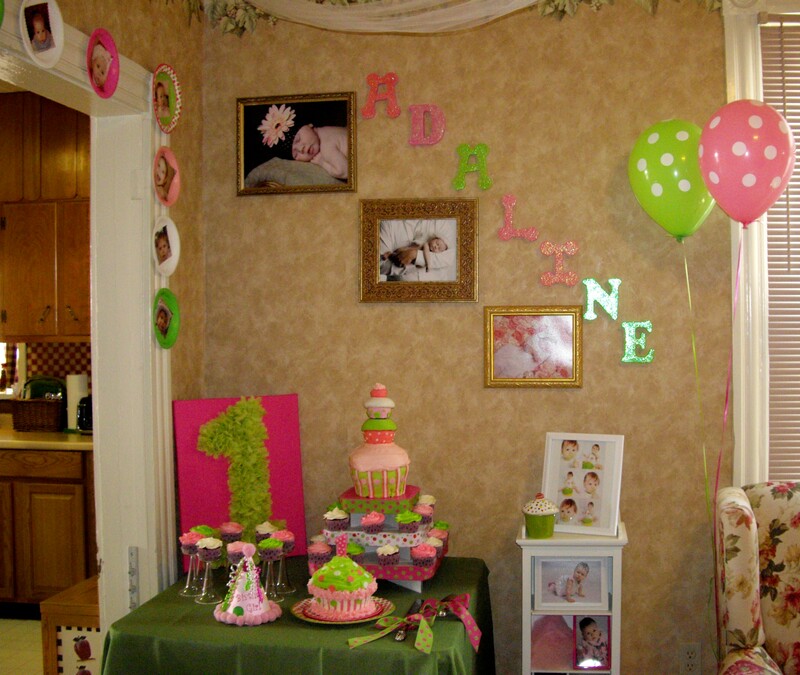 The black “Adaline” letters are usually on a shelf in her bedroom, they’re from The Hobby Lobby. 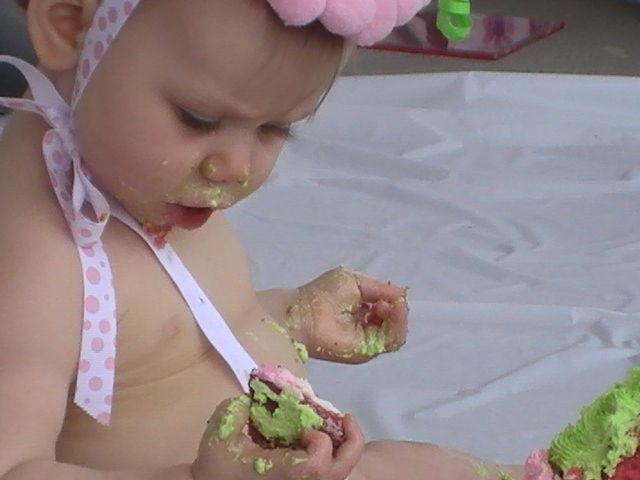 Below is Adaline digging into her smash cake. 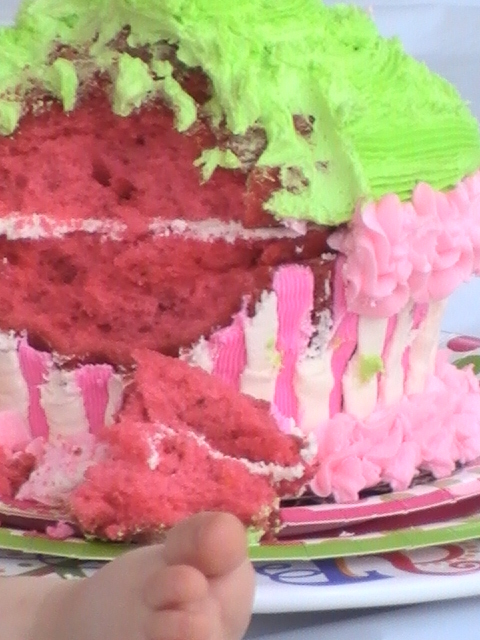 It was a banana flavored cake tinted pink (even though it looks red in the pictures). 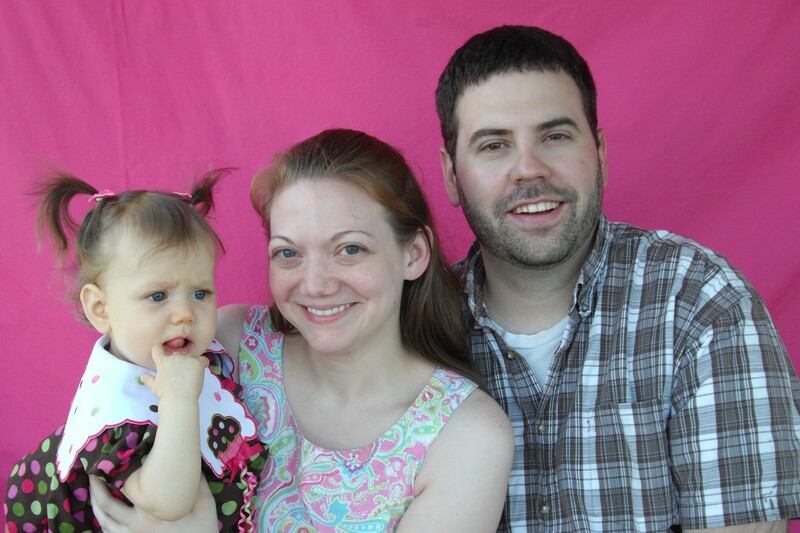 Our happy family (with a very tired baby) at the “photo booth” after a long and exhausting, but totally awesome party! 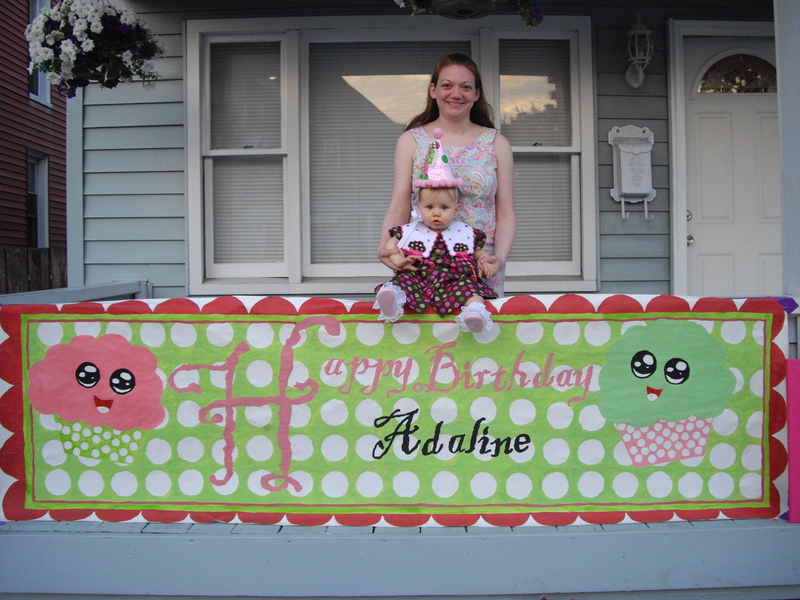 The DIY Tissue Number Sign that I made for Adaline’s 1st Birthday was featured on www.prudentbaby.com!